﻿ Three women and one man posing on the steps in front of a synagogue [?] as woman in coat walks past them. Three women and one man posing on the steps in front of a synagogue [?] as woman in coat walks past them. 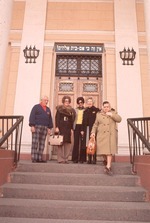 Three women and one man posing on the steps in front of a synagogue ? as woman in coat walks past them.